Alabama -- After months of debating amongst themselves, Alabama state representatives have finally agreed to require geology teachers to teach "Paul Bunyan Theory" as an alternative to the scientific explanation for formations such as canyons and mountains. The controversy all started with one mother, by the name of Christine Nightingale. "Ya see, my precious little daughter came home to me one day and said to me, 'momma, my science teacher told me that lakes were made by holes left by glaciers, and mountains were made by Tectonic Plates, and the Grand Canyon was made by erosion!' I was outraged when my sweet little daughter told me this. Them science teachers was filling up her sweet little head with outright lies! I believe in Paul Bunyan, and so did my mother before me and my grandmother before her. Why should my sweet little daughter believe any different?" The cover of the official Bunyanism textbook,Almost A Science: How Lumberjacks And Their Blue Oxen Shaped The Geology Of The United States, which was shipped to all Alabama schools shortly after the mandate was passed. So Mrs. Nightingale set out on a mission to make the teaching of Paul Bunyan stories in schools mandatory. "I don't care how much evidence them scientists have!" she said when presented with several hundred textbooks describing in detail the processes of erosion and plate tectonics, "All that evidence is FAKE! All that matters to me is that they are wrong, and I am right!" She tried to get it mandated in a school in her home town, but she was turned down. So, she got some of her other traditionalist friends together and they decided that in order to get the Paul Bunyan stories acknowledged in schools, they would first have to make Bunyanism into a legitimate science. "We all KNOW it was Paul Bunyan's footprints that made all the lakes in Missouri, and it was Paul Bunyan dragging his axe that made the grand canyon, and it was Paul and his Ox, Babe, piling up rocks trying to put out their campfires that made the mountains. We just KNOW it's true! But we have to make it into a scientific theory now!" So she and her friends, after a night of heavy discussion, came out with "Paul Bunyan Theory." The theory states that "The natural features such as mountains and rivers are too big to have been made by nature, and were instead created by some large, intelligent, lumberjack-like being." The theory almost instantaneously came under fire from all three of Alabama's scientists. "There is nothing scientific about this!" says a representative of the Alabama science institute (a building roughly the size of a janitor's closet), "This is just a fancier way of saying, 'we refuse to accept science because our parents told us that Paul Bunyan made everything.'" Miss Nightingale and her colleagues have asserted that "We don't specifically SAY it was Paul Bunyan who did it, we just say it was an intelligent, lumberjack like being!" Scientists argued back that there are very few other large lumberjacks other than Paul Bunyan, and they also made the point that the theory is obviously referring to Paul Bunyan, because Bunyan is in the theory's name. 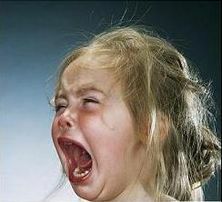 A traumatized child who has just been told by her science teacher that Paul Bunyan in fact did not create mountains and canyons. Despite scientific objections, people rallied around the theory and started demanding that it be taught in schools as an alternative theory to popular geology. After several days of debate, Alabama state government officials agreed that the theory should be taught in all schools. Today, all teachers in the state are required to spend the same amount of class time on geology as they spend on Paul Bunyan theory. President Bush has expressed his support for Paul Bunyan theory, saying "I only support science that is in tune with my own point of view. This here is a theory that is truly in-touch with American values, and therefore I support it 100% and plan to make it mandatory for all schools across the nation." 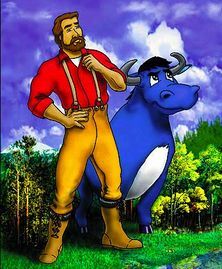 The REAL Paul Bunyan, an obese man who now lives in Timmins, Ontario, Canada with his blue gerbil named Babe, has not yet commented on these proceedings. This page was last edited on 2 November 2014, at 23:34.